hd00:43Expressive head and mighty shoulders of gorilla female on green stone wall background and looking around. Human like monkey in shaggy black fur. Excellent beauty of wildlife in the amazing HD footage. hd00:14Hand care of an old gorilla female, very muscular monkey with mighty and callous fingers. Human like manipulation of a great ape, the biggest and the most severe primate of the world. DSLR, Canon 5d. hd00:34Gorilla baby, sitting on his mother, which likes kissing his doodle. A kid, that is going to be great ape, the most dangerous and biggest monkey of the world. Beauty of the wildlife in the HD footage. hd00:27Hand caring of a gorilla female, very muscular monkey with mighty and calloused fingers. Human like manipulation of a great ape, the biggest and the most severe primate of the world. DSLR, Canon 5d. hd00:09Mother love and tenderness of a gorilla female, the biggest monkey of the world, hominid primate. The great ape shows very careful treatment of her baby. Amazing beauty of the wildlife in HD footage. 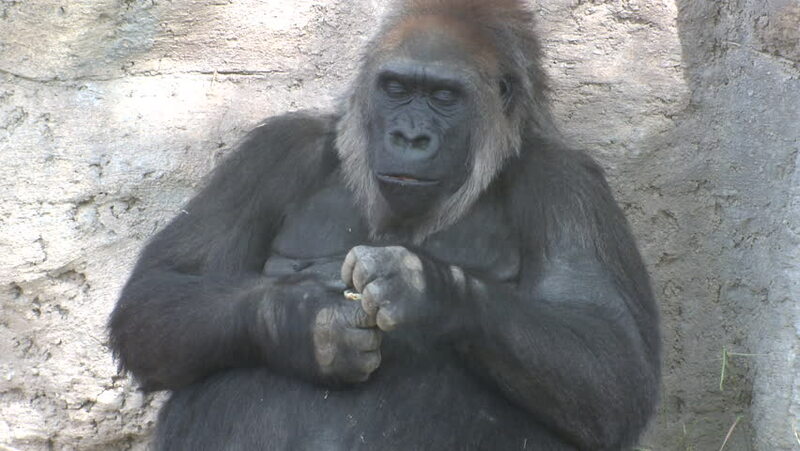 hd00:27A gorilla female, lying on stone background and cleaning her nose without any shame. Human like monkey with expressive face in shaggy black fur. Wild beauty in the amazing HD footage.